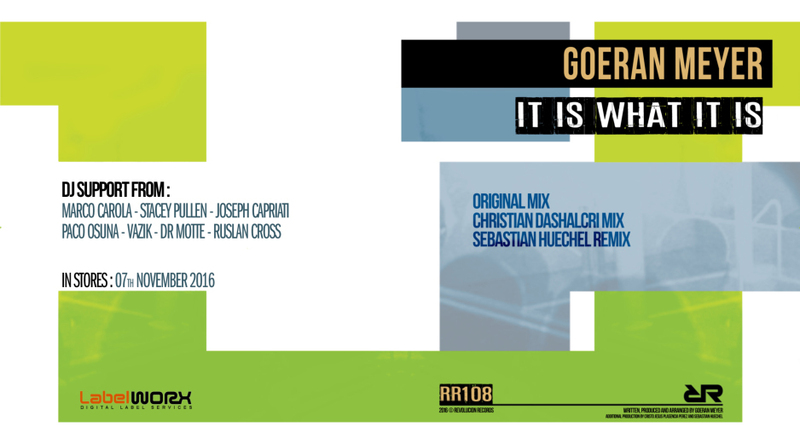 The latest release from the team at Revolucion Records brings the welcome return of their highly talented German born star Goeran Meyer with his latest deep house cut 'It Is What It Is'. Up first comes Goeran's superb 'Original Mix' blending deep undertones, groovy bassline and subtle male vocal stabs perfect for those deeper moments. Next comes the superb 'Christian Dashalcri Mix', taking things on a deeper atmospheric trip whilst taking the male vocal to a different level. Rounding things off 'Sebastian Huechel Remix' follows a similar deep groovy path of the original yet with a subtle almost melodic twist.